Seven activity sheets, created by Working Classroom interns and Christine Wong Yap, were printed and installed at five places of belonging. Downloadable PDFs are also available below. 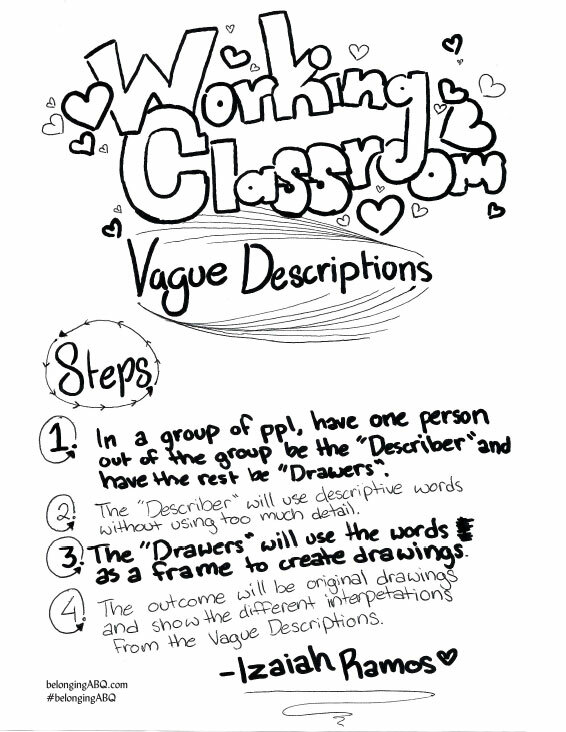 Vague Descriptions, a group drawing activity by Izaiah Ramos, Working Classroom intern. Activity sheet located inside Place of Belonging #2: Working Classroom. PDF. 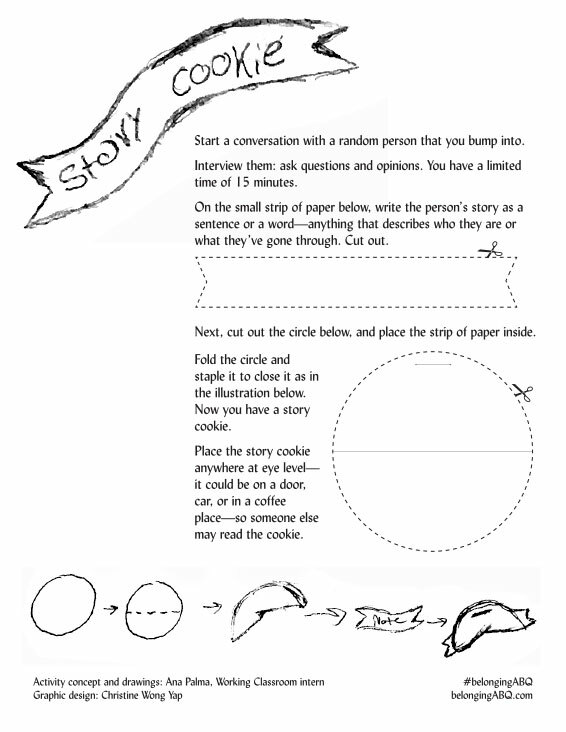 Story Cookie, an intervention activity by Ana P. Palma, Working Classroom intern. 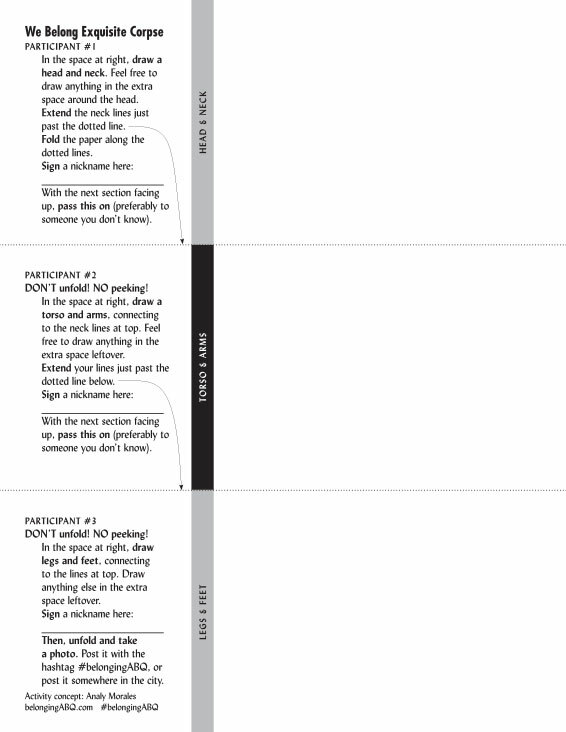 Activity sheet located inside Place of Belonging #2: Working Classroom. PDF. We Belong Exquisite Corpse, an interactive drawing activity concept by Analy Morales, Working Classroom intern. Activity sheet located inside Place of Belonging #2: Working Classroom. PDF. 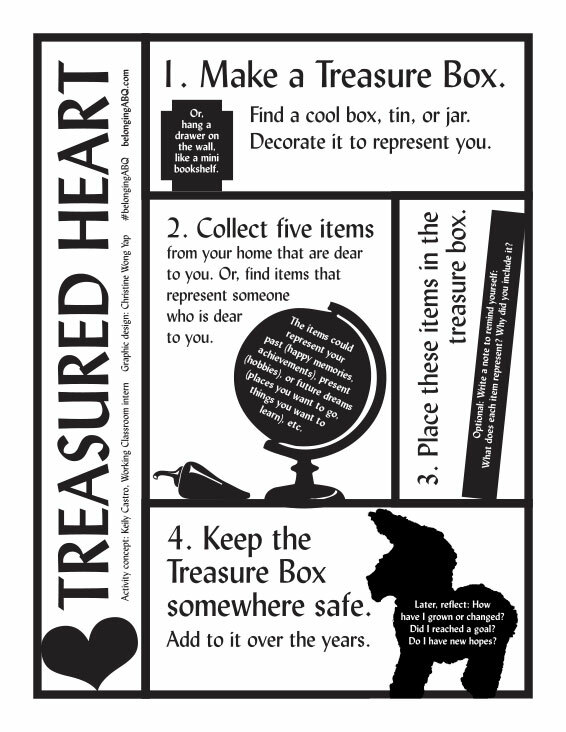 Treasured Heart, a collecting activity concept by Keily Castro (with additions by Christine Wong Yap inspired by “the symbolic ecology of the home” as described by Mihaly Csikzentmihalyi and Eugene Rochberg-Halton in The Meaning of Things: Domestic Symbols and the Self). Activity sheet located inside Place of Belonging #2: Working Classroom. PDF. 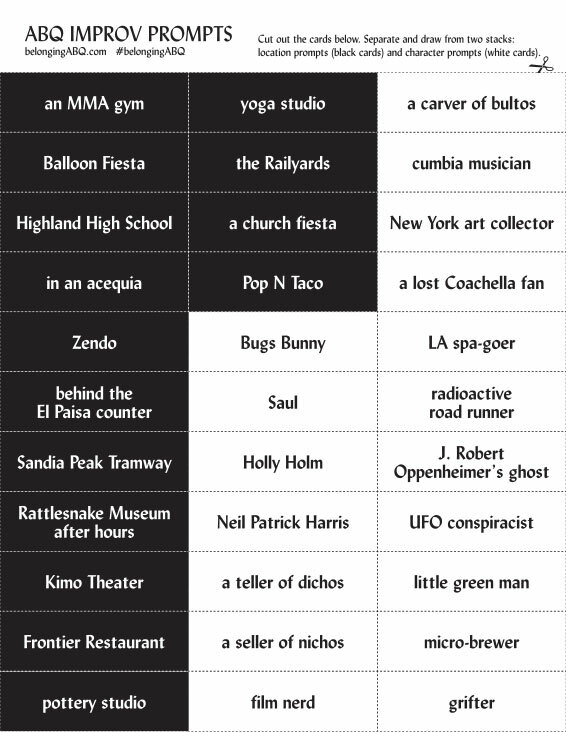 ABQ Improv Prompts, sheet of 33 cards of locally-inspired locations and characters, by Christine Wong Yap. Activity sheet located in the lobby of Place of Belonging #3: The Box. PDF. 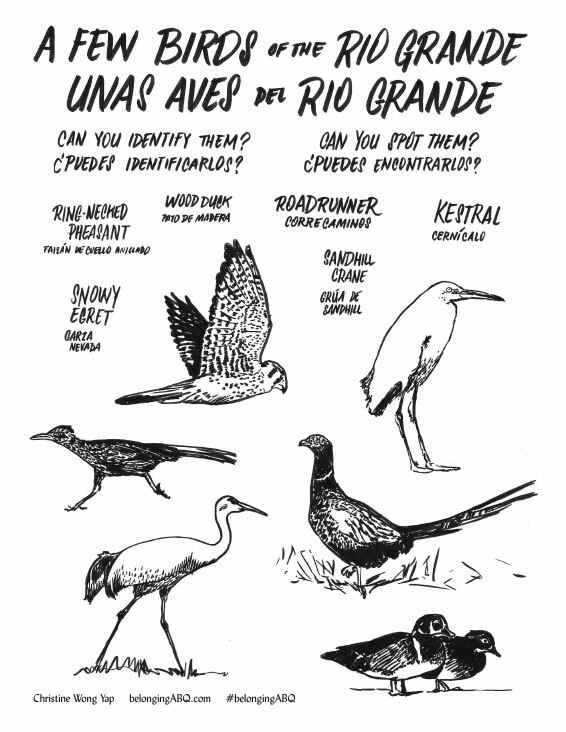 A Few Birds of the Rio Grande / Unas Aves del Rio Grande, a birdwatching activity suggested by Barbara Bell and created by Christine Wong Yap. Activity sheet located at Place of Belonging #5: Riverside Drive SW, at the northern bend near a footpath to the river. PDF. 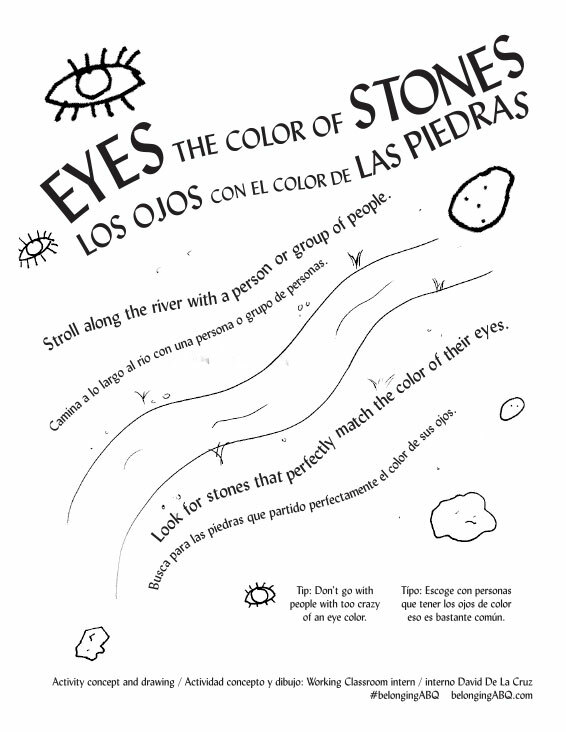 Eyes the Color of Stones / Los Ojos con el Color de las Piedras, an observation activity by Working Classroom intern David De La Cruz. Activity sheet is located at Place of Belonging #8: The Bosque, near the Paseo del Bosque trail at Central. PDF. *An activity box at Place of Belonging #10: Saranam, in their child care center (not open to the public), holds copies of all activities. Saranam provides childcare to families while parents attend educational programs. Activities: Authors as noted, Belonging Activities, 2017, laser output from ink on paper and digital media, 11 x 8.5 inches each, first printing 100 copies.